A key thing for me when building our new extension was to make sure we had a means of cooking and heating off grid should we need it. We already have a stove in the sitting room that we use all winter. There's not many nights between November and March where it's not lit and we have plenty of firewood to keep us going. And although we can put a pan on top of the stove it's not ideal to cook with. Love the look of our new stove! I was a little obsessed with finding the right stove for our house and spent many houses researching what we should have and what would fit. To start with I thought it would just be another log burner like we had in the sitting room, maybe with a small oven on top. Luckily once I'd worked out what size we'd have available and spoke to some experts it turned out we could have a full on range in there! The size of the chimney space went up and suddenly what would have been a little fireplace has turned into the main focal point of the room. This was a real game changer, now we could have a full sized oven! Looking through what was a available a few really stood out and were within our budget. In the showroom we'd taken a real shine to La Nordica Rosa L but when the fireplace was finally finished it turned out we could have the biggest size the XXL. This bigger size just meant a far bigger oven, so all our normal trays and things could still be used, much better for day to day cooking. The rest of the stove was pretty much the same. I did go for the optional extra of the plates on top as this makes the temperature much more controllable as you can open or shut them. With more heat being directed either up the chimney or into the room or oven. The fire box is huge! Can fit double what's in our other stove. We lit it for it's first test firing the other night and, although it took a while to heat up, it really chucked out some heat. The oven got up to temperature and the fire box was simply huge, it'll be great to load it up and leave it cooking away! We haven't tried the oven part yet but I full intend to this week. 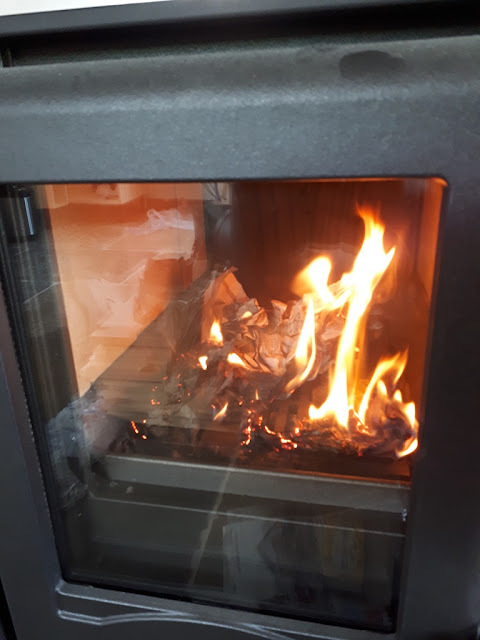 It does feel that with both fires going we'll be able to heat the whole house off grid should we need to, and although the heat takes a while to get into the bedrooms it soon finds its way up there. the big solid chimney also acts as a great heat sink and makes the middle of the house feel warmer for ages. What would be your dream off grid heating set up? Looks amazing, I'm a tad jealous. Ha! thanks! You're not the first to say that to me! Beautiful. Didn’t even know you could get something like that. I knew what I liked. I always hated not seeing the flames in the one my parents used to have. Nice to know how well the fire is going. It does chuck out a fair bit of heat though! It's solid concrete blocks covered in a sand and cement render. 100 percent fireproof! There a good 4 inches to every side as well. Mom still cooks on one. I like those! I really wanted one I could see the fire with though. I love watching the flames, I think it's primal instinct. Stay warm and enjoy your winter. Thanks! Yeah can't wait to have stuff bubbling. I thought it would be great for stock as well! When I was a Airman at RAF Alconbury, we had a Hospitality house ministry that was based in a former Rectory.......Hang on, Now I have to go look it up!.....Woolley! Google says it is St. Mary's Church and the rectory is right across the road. Anyway, the house had a AGA stove in it that the missionary's wife cooked many a meal on for us hungry Airmen. I'm feeling stupid right now; being a farm boy from Minnesota, I should have went out into the country more and got to know the farmers......Oh well, good memories anyway! If anything I'm worried about this being too hot for the room and looked at an isolated flue but with the top plates it won't fit. I can't wait until I've the kitchen finished and I can have more friends and family round for tea. i would love to have a stove like that. it's beautiful! I love it! We have a similar set up in our 1970's house- log burner in the living room and (reconditioned) Rayburn in the kitchen. We have no radiators downstairs and rarely put the upstairs ones on and when we do it's because the vintage windows contribute towards a damp problem. Hopefully when they're replaced next year upstairs will be warmer. Cooking on the Rayburn takes a bit of a knack, and I've cooked on wood fires all my life. I did go with a friend on an Aga cooking day at a local showroom which gave useful tips (and a lovely lunch!) It might be different with your stove but I've found it best to minimise the length of time the lids are open if I want the oven to be hot, for instance. Does yours have a warming oven? Using that can be helpful- bring veg like carrots up to the boil and then put the pan in there and they carry on cooking, like in a hay box. We have radiators and the ones downstairs are for when we're feeling lazy or ill! I can shut them off and will need to when this is running I think! I'm really looking forward to cooking on it and making more stocks as it's not using electric all the time. No warming oven on this one but that's a great tip, even with the hot plate. Yes, it’s great for things that take a long tine. At the risk of sounding like my granny, I sometimes boil hankies on it and also simmer orange peel and a couple of cloves in the winter as a room fragrance, like they suggest in magazines but I’d never do in my electric hob ! Have you got a stove fan? They make a huge difference to moving warm air around a room. I have a fan for the one in the sitting room but not this one yet. I think it needs one though. Love the idea of a bit of orange peel and cloves for a nice smell. I'll have to try that! Very nice Kev! We, too, wanted to have something we could eat, heat and warm our water from so I know just where you are coming from. Our Rayburn always gives me the warm and fuzzies on a cold morning when we light it. Enjoy. Nothing like the heat from wood like that is there? It somehow heats the house differently and I know what you mean about the fuzzies! The walls would be a mess if I tried cooking there! (I don't cook very often). It looks warm and cozy. It is a concern but I'm hoping it won't get too bad as it's a distance to the walls. Also the paint is one I should be able to wipe. We were sort of off grid for heating and hot water at the smallholding except for when the children moaned and needed the storage heaters on! I'm sure we'll still use the central heating as I don't like a really warm house and once the fires are lit it soon warms up. Can wait to learn to cook on this! Should be great fun. I love the thought of three kettles! I never drink hot drinks but be great for cooking and for the wife to have her cuppa tea! I always remember getting up early to take lambs to market and my dad using the rayburn to boil water for his coffee as it was much quieter and would wake everyone else up. Kev, I love your new stove! I don't think we have anything like it over here, although I haven't looked for at wood cookstoves since we got ours. Looks like you made an excellent choice. You can put ducted floor vents in the ceiling through to the rooms above to allow warm air to circulate and not just be trapped downstairs. It's something I've thought about. To be fair with both running upstairs doesn't seem too bad and if they're on a for a couple fo days the whole house feels warm from them. That looks lovely! I like the glass doors. 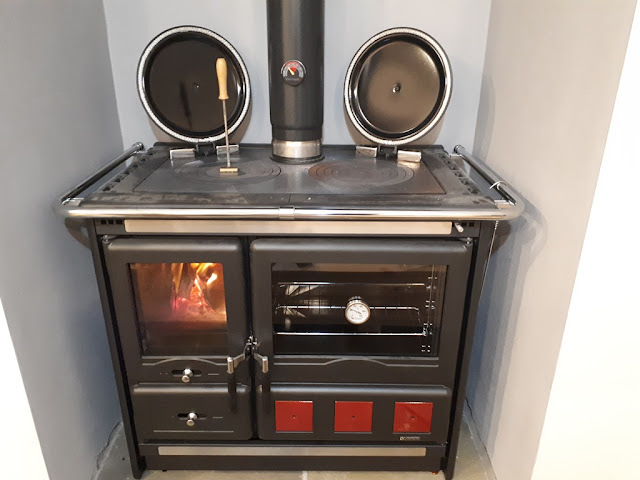 I don't remember that being available when we were looking for a stove for our kitchen, but we wanted one that did hot water as well, so have an Esse range cooker. Nice size firebox saves some splitting! - We find that if not too breezy ours will stay in overnight with a big log. The main problem I have with ours is dust - kitchen storage needs to be in cupboards: the ash gets everywhere, but otherwise I love it - great for cakes. I assume the silver at the bottom of the flue is a damper, and you have a warming drawer under the firebox for drying wood, what is under the over side? How is it for cleaning the flueways? Ours is a right pain to do, and some of the fittings are not great.